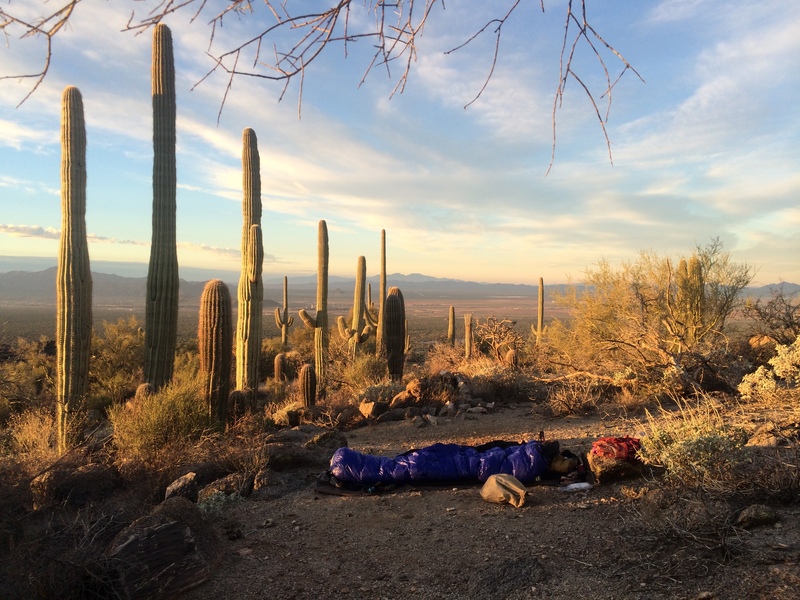 Despite working for a trail organization, I get stuck behind my computer and an endless stream of emails and phone calls. 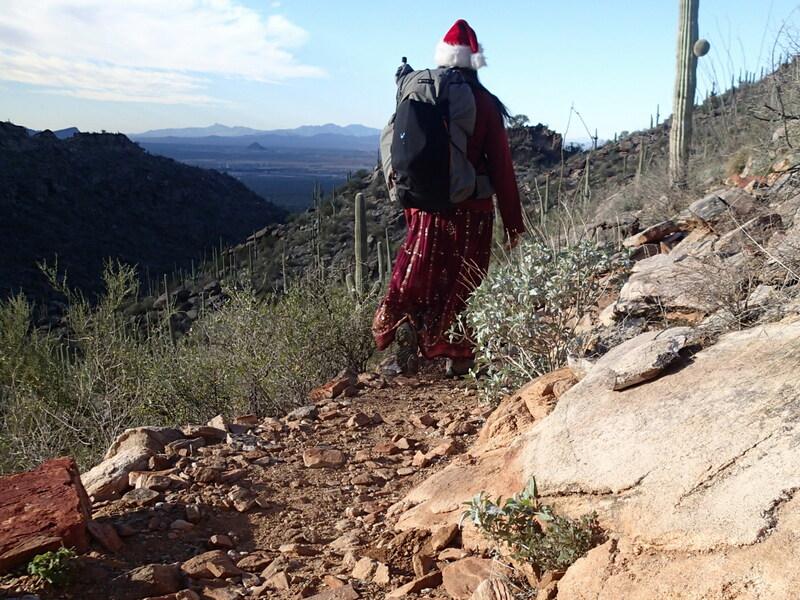 I needed to get away for a quick overnighter and realized I hadn’t hiked the new Tortolita Ridgeline Trail. 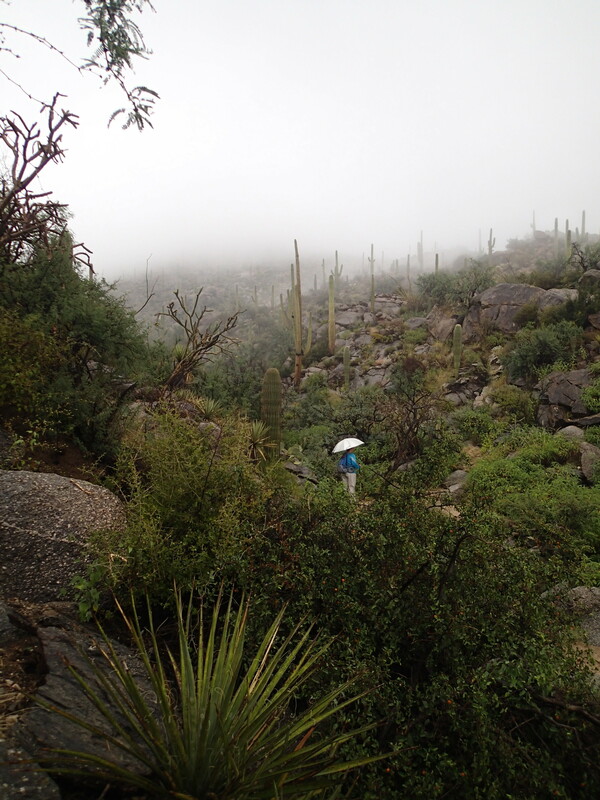 I worked until 4 and got hiking by 5 on the Tortolitas Superloop. 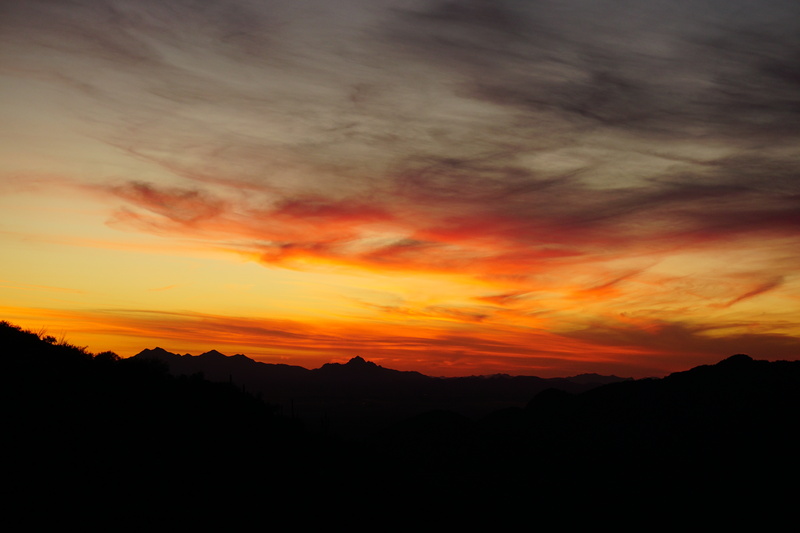 Made it onto the Cochie Canyon Trail for a great sunset- I almost missed the best part of it cause I thought it was over and started hiking again. 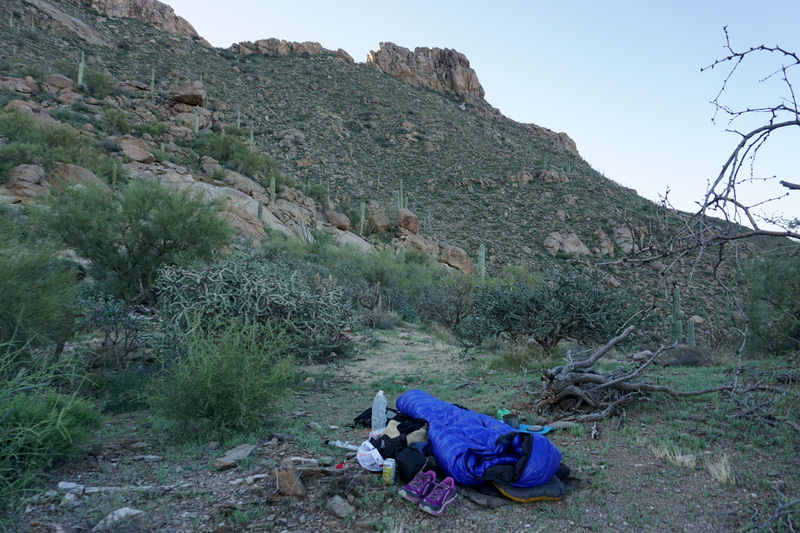 Found a spot after hiking with my headlamp for a bit that had the only flat real estate around and set up camp. 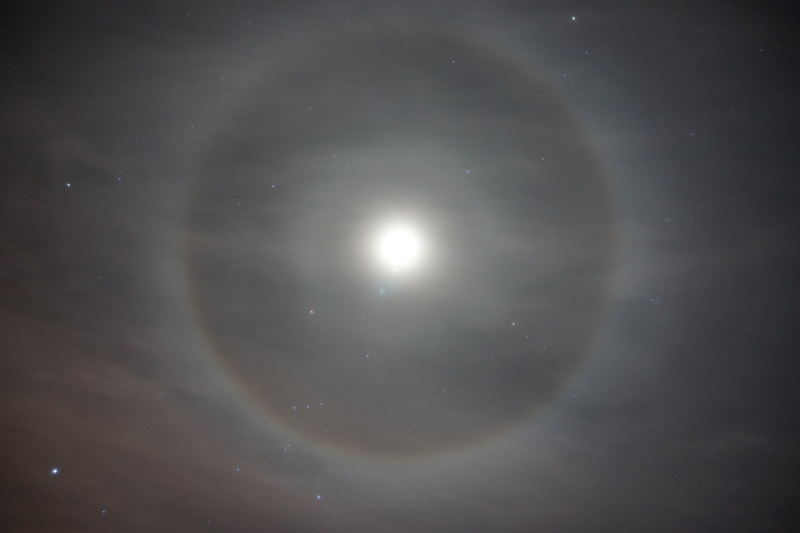 Had an enjoyable evening with a beautiful halo around the moon for photography. 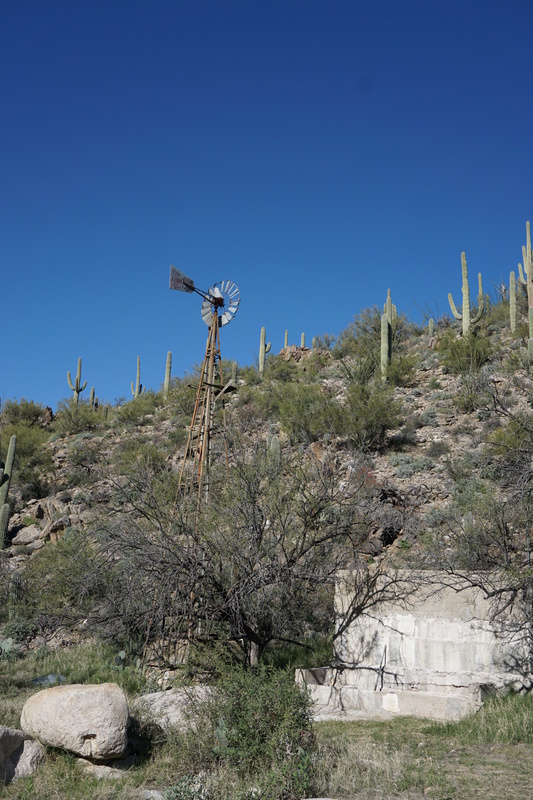 The next morning, I hiked to the old windmill and got on the connector route over to Wild Mustang. 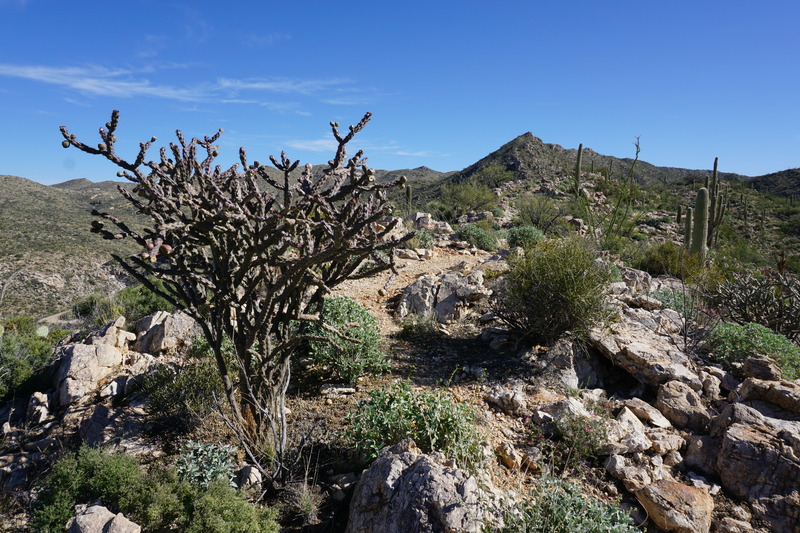 When I reached the saddle, I explored a well-cairned route that seems to go back under the rocky peak and toward Wild Burro Wash. Something to check out next time. 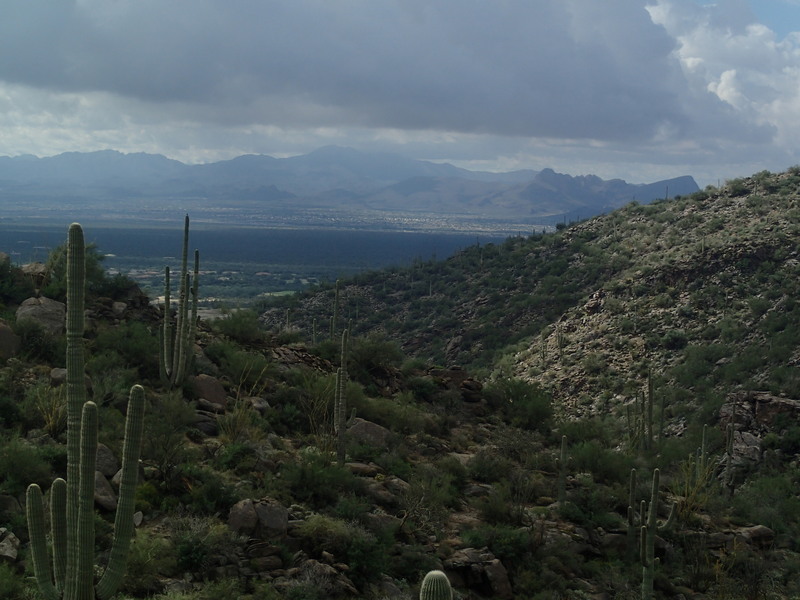 There were great views of the Catalinas and Picacho Peak from the saddle. 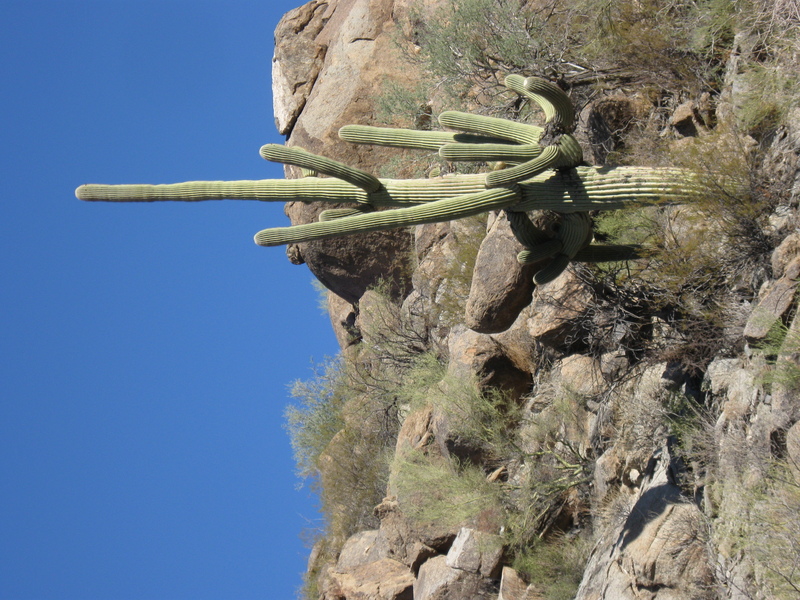 The route goes past a crested saguaro that has seen better times- a victim of the frost of 2010. 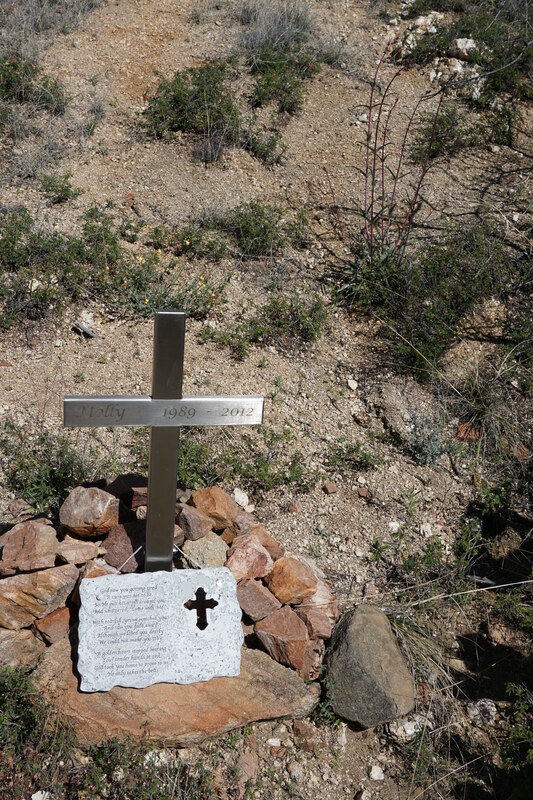 I made it to the Wild Mustang and took it to the new-to-me Wild Burro Tank/Goat Corral trail. 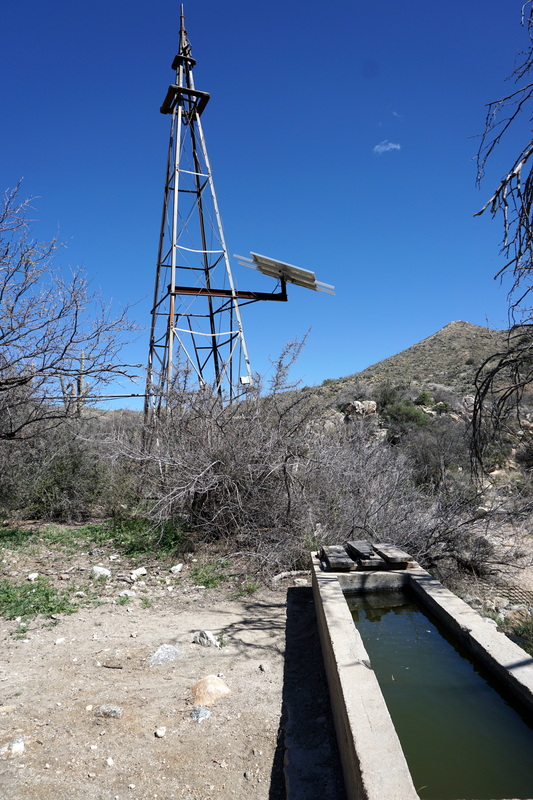 This trail meanders through the desert until it reaches Wild Burro Tank, a solar windmill with a big metal tank and a wildlife tank with a covered float. 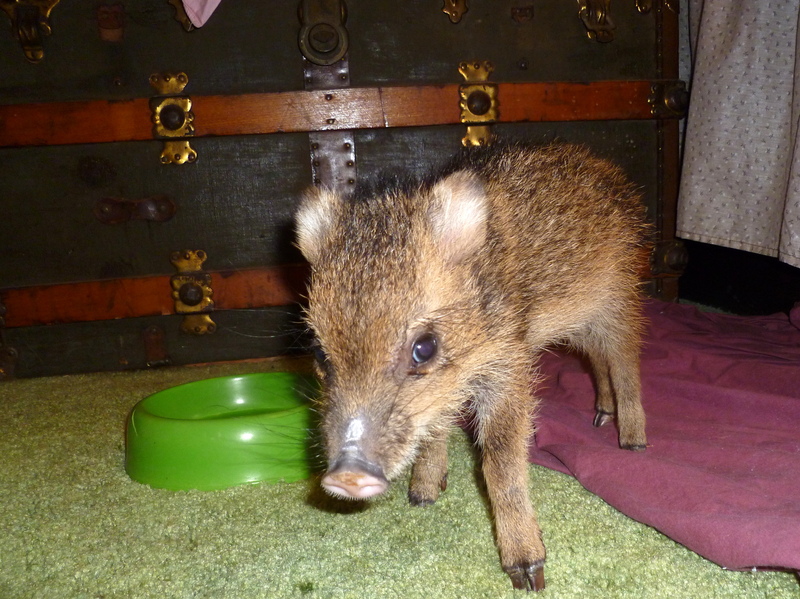 I had brought all my water for the two days but took on an emergency liter from the tank just in case. 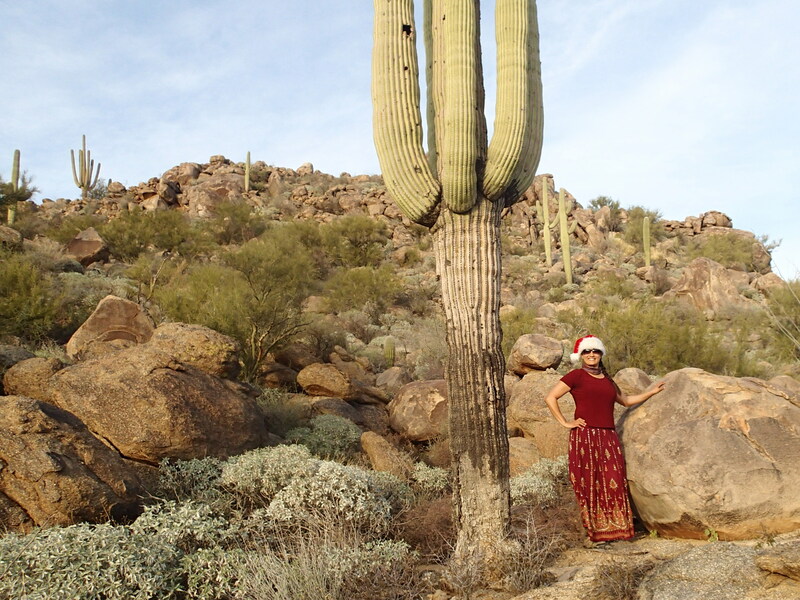 Such a desert hiker. 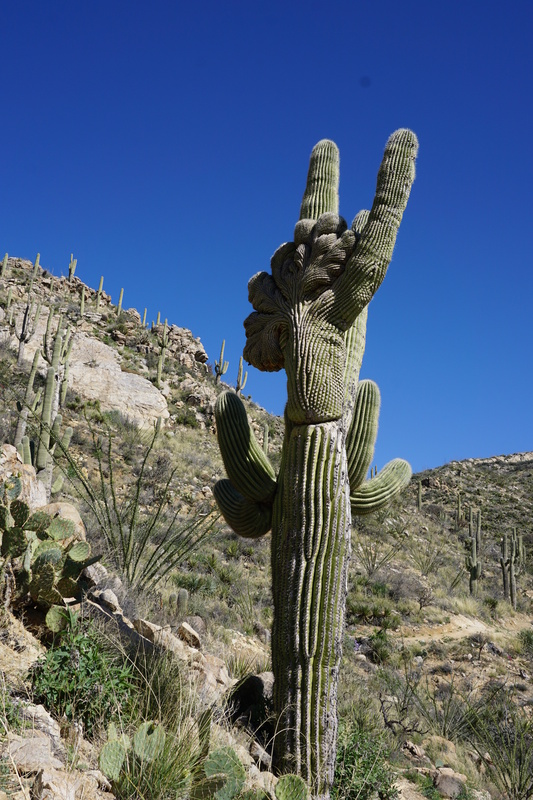 Crested Saguaro on the route down to Wild Mustang- this is a very rare mutation and no one knows why it happens. The Tortolitas seem to have a high concentration of them. 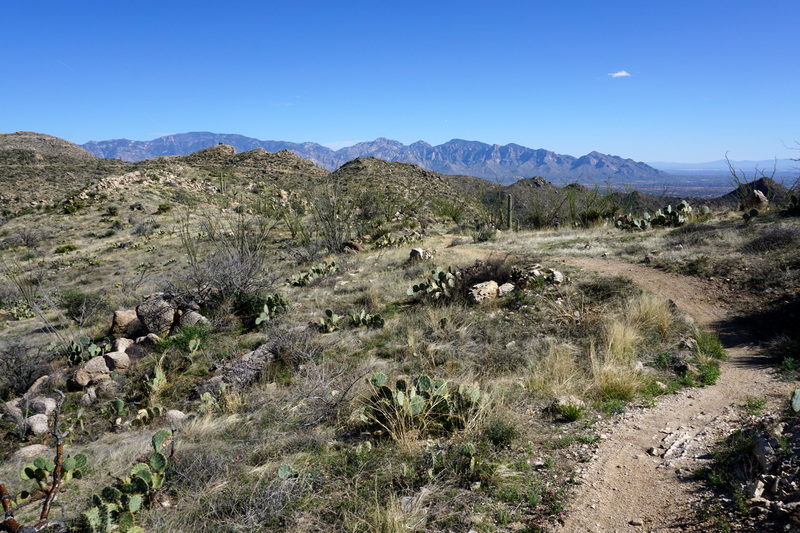 After exploring the Goat Corral area I started up the Ridgeline Trail’s lazy switchbacks up to the ridgecrest. The trail construction in the Tortolitas is amazing! The new Ridgeline is a delight! 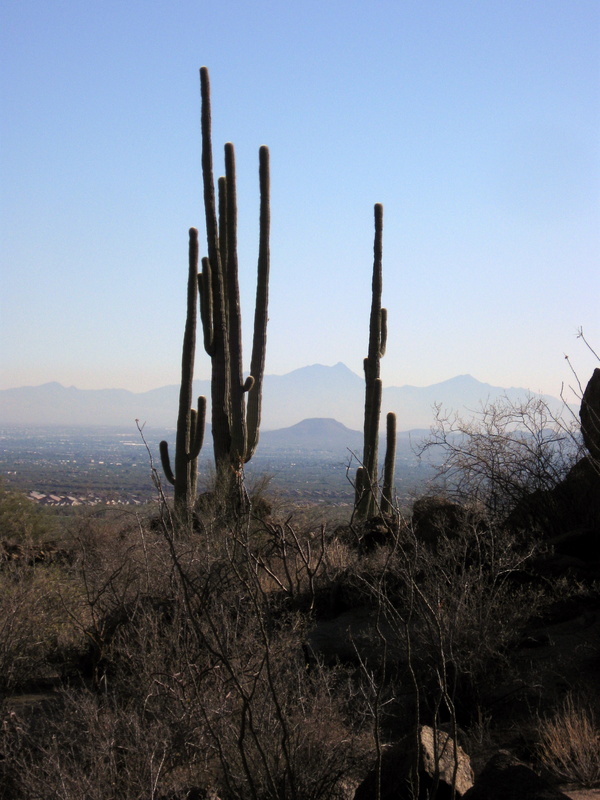 It contours around, swooping this way and that to stay on the ridgeline and offers incredible views down into the Tortolitas as well as views of the Catalinas, Santa Ritas, and Picacho Peak. 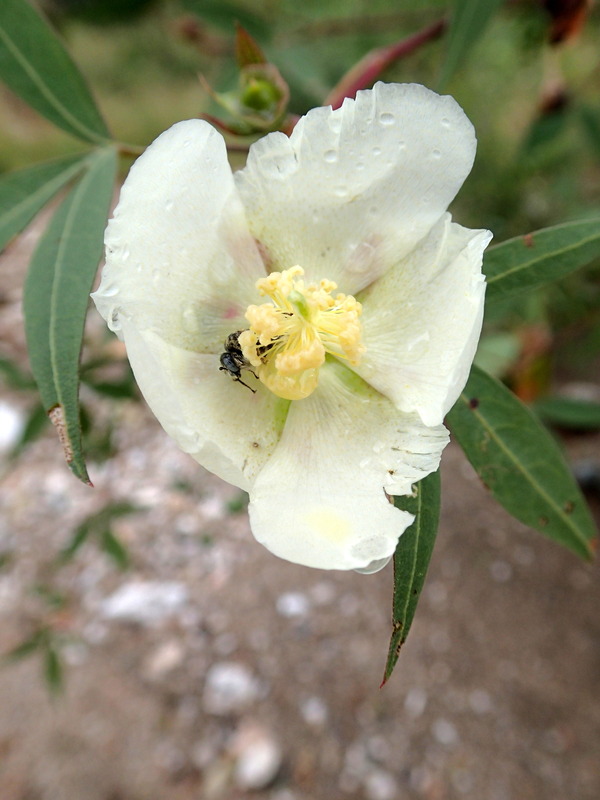 All of this and wildflowers too, many varieties including some fragrant ceanothus. I was super-excited to be on such a sweet fresh piece of trail so close to my home. Road that goes out east to Edwin Rd. The Wild Burro Tank/Ridgeline loop eventually drops you back at Wild Burro just a little ways down from where you started the loop. It’s a great tour of the interior of the Torts. I took the Wild Burro Trail all the way and made it back to my car with out seeing anyone for the entire time I was out. A perfect little getaway. 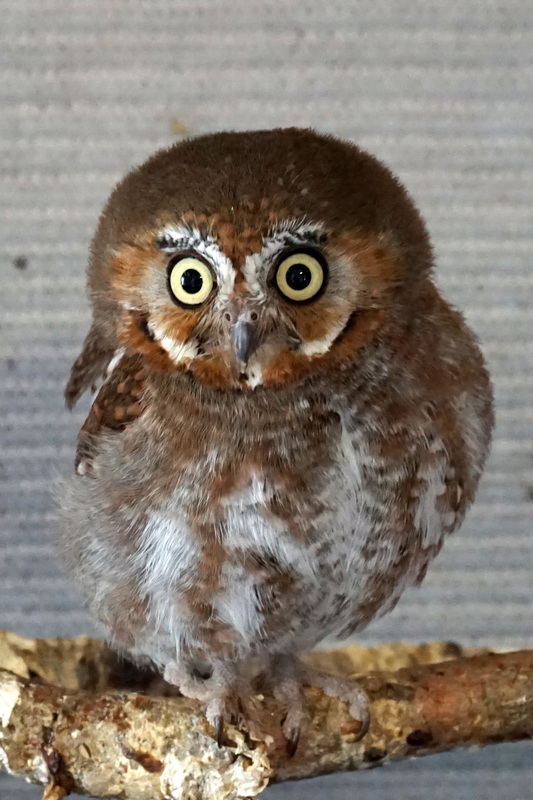 In Wildlife Rehabilitation news, Elfie the Elf Owl, Citan the Harris Hawk and Luna the Great Horned Owl will be out and about as part of the second annual Arizona Trail Day and Colossal Campout happening on March 28th. 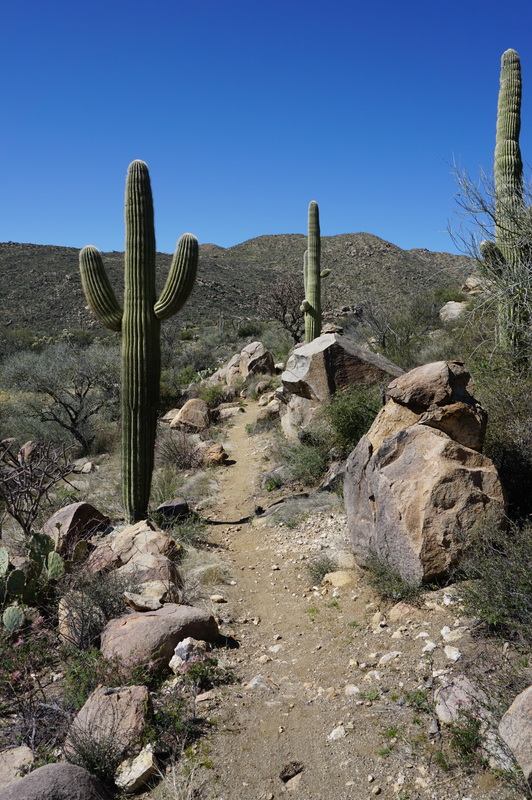 Trail Day is a full free day and night of fun on the Arizona Trail and the birds will be part of our Outdoor Expo, which runs from 12-3 at Colossal Cave Mountain Park. 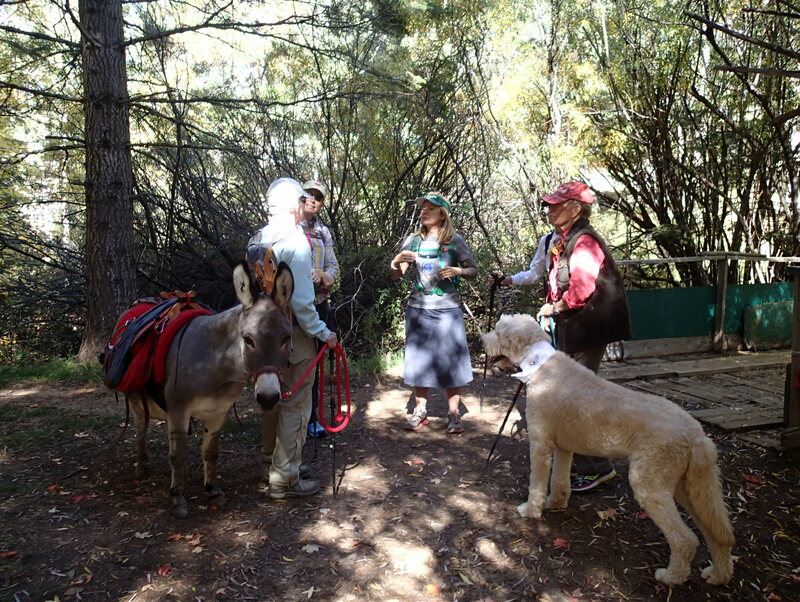 Registration is open for the hike, bike ride or equestrian ride in the morning and for nighttime fun at La Selvilla Campground with music by Eb Eberlein and friends, tasty food by It’s Greek to Me and Arizona Trail Ale by the campfire. 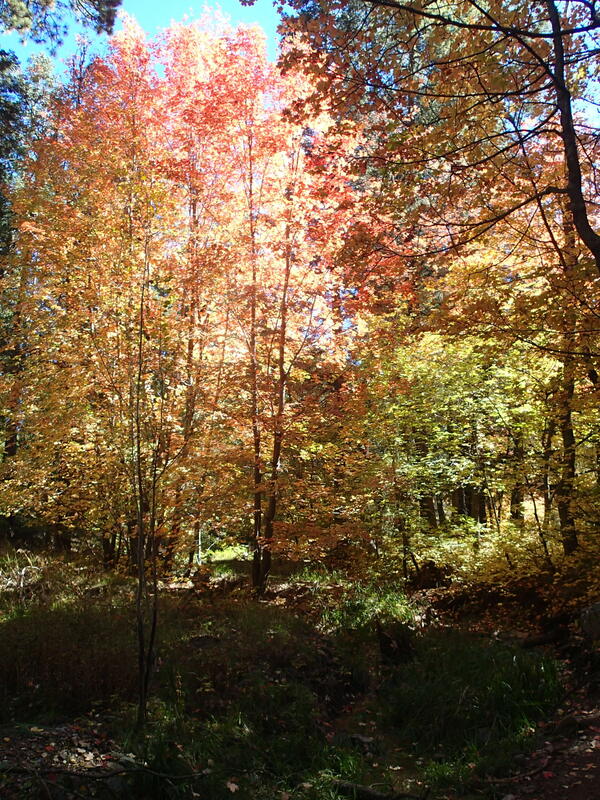 Free entry to the park and camping for Arizona Trail Day! 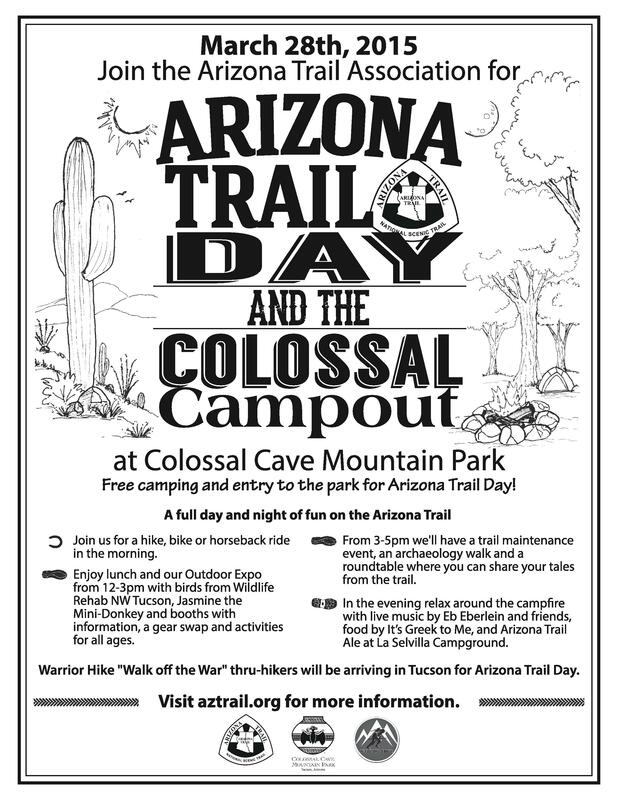 Visit http://www.aztrail.org/trail_day/ccmp.html for more details. 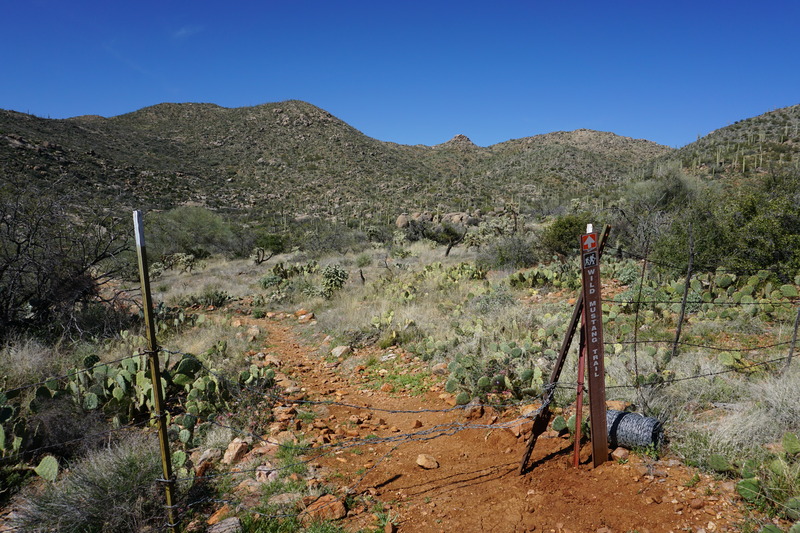 Update (9-15-10) There is now a trailhead at the Ritz-Carlton resort that cuts out a portion of the boring wash walk I talk about in the beginning of the post. I had big plans for today’s hike. 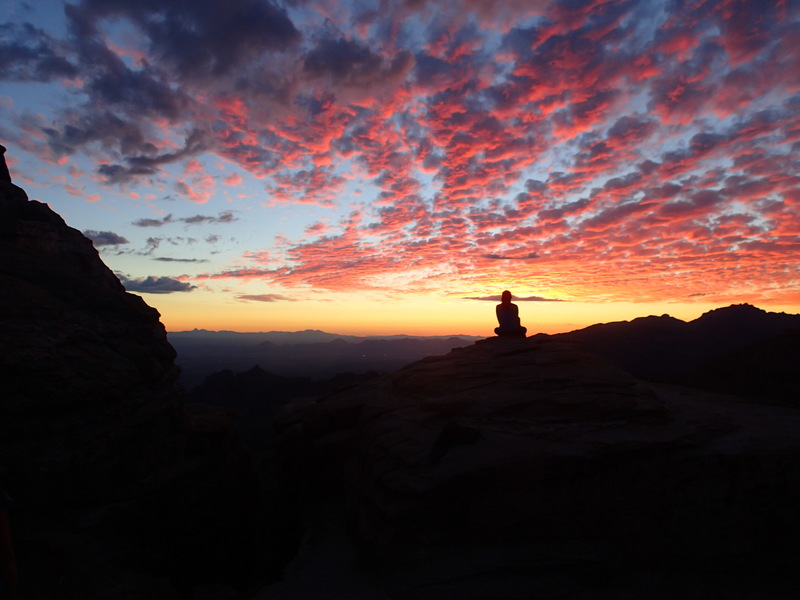 I was going to get up before sunrise, drive two hours up to the White Canyon Wilderness area and do an off-trail hike of The Spine. 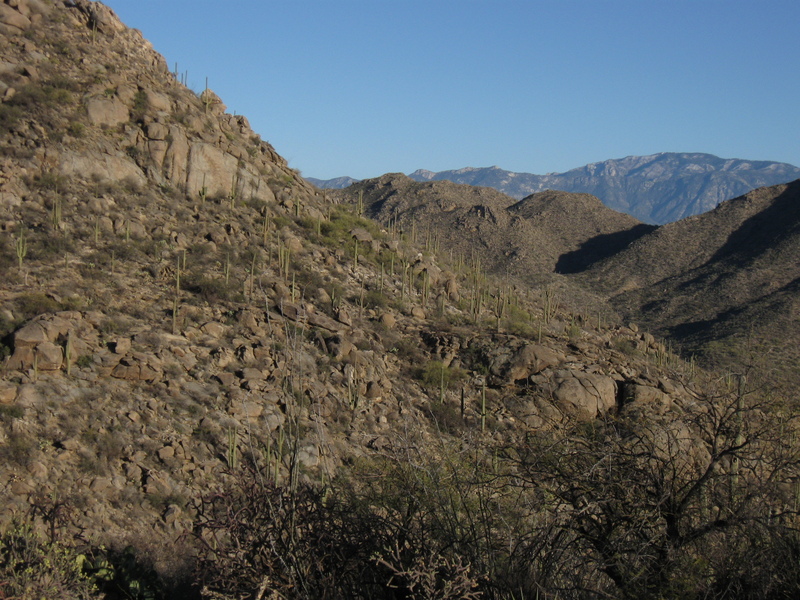 The Spine is a boulder-topped ridge that runs northwest from the Gila River and the hike was described as “epic”. Big plans that I realized were not going to happen as I lay awake at 4:00 in the morning. I had gone to bed early, but was woken up by my dog Zeus throwing up at about 12:30. Normally, I have no problems going back to sleep after waking up, but this time it just wasn’t going to happen. I finally got back to sleep at about 5 am. 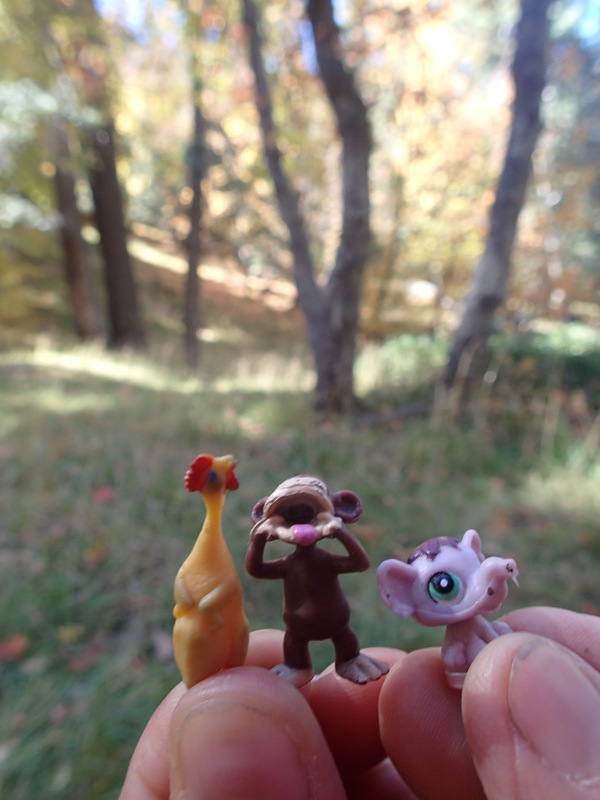 So when I woke up at 11, still feeling weird, grumpy, and sleepy, I wasn’t sure that I was going to go for a hike at all. I was disappointed that my day on The Spine was going to have to wait. After eating some breakfast, I figured I would rather be outside than inside. It was a beautiful day and being outside always lifts my mood. 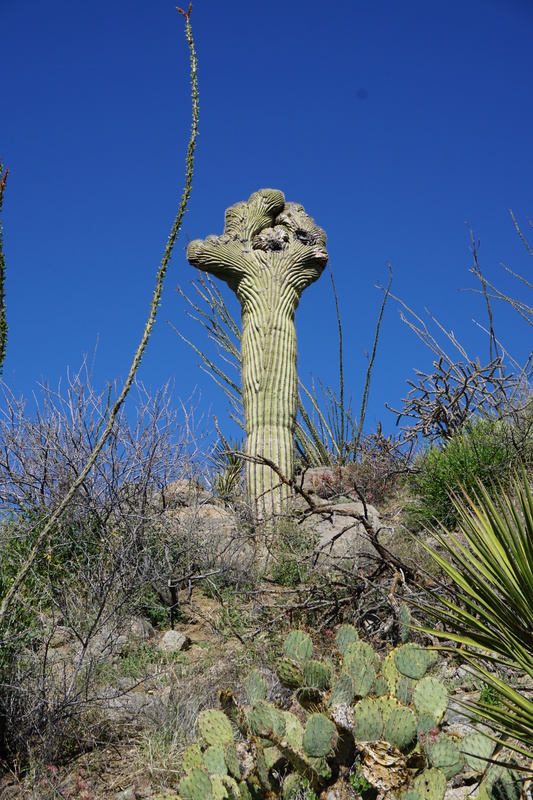 A saguaro with an array of arms that looks like a hand. I feel better already. 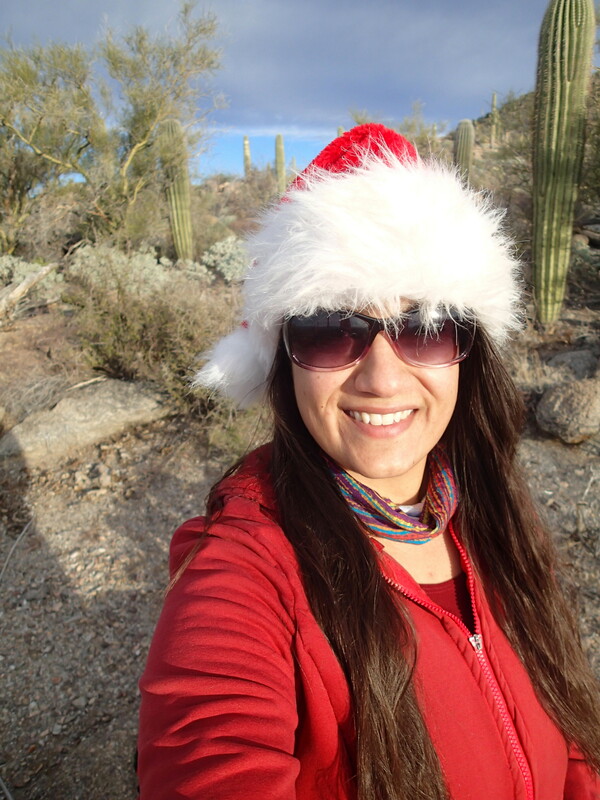 I got on my favorite website for hike planning HikeArizona.com and perused my options. 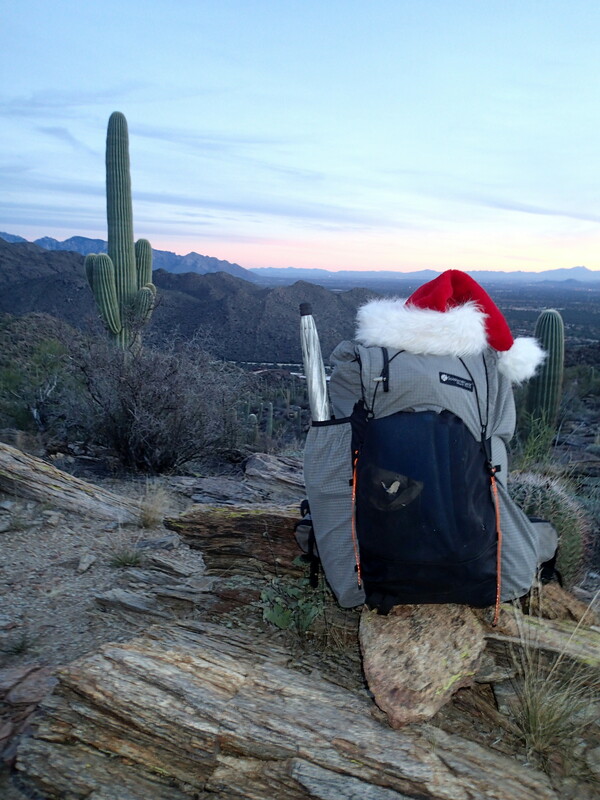 This is one of my favorite websites- the founder, Joe Bartels, a hiking madman himself, has put together a tremendous resource for the hiking community. 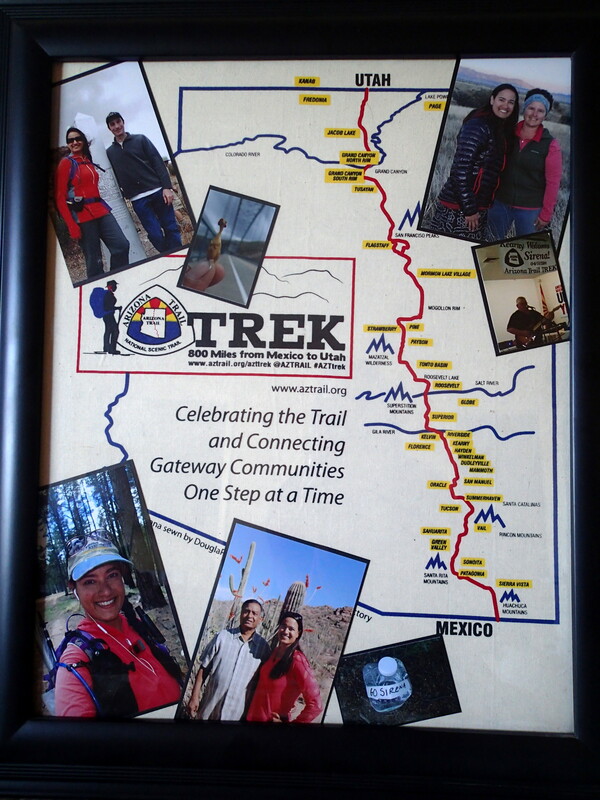 There are trail descriptions, maps, GPS tracks, pictures, and triplogs so you can really get a feel for each trail. The forum is great, and I have learned about a lot of areas that I otherwise may not have heard of. 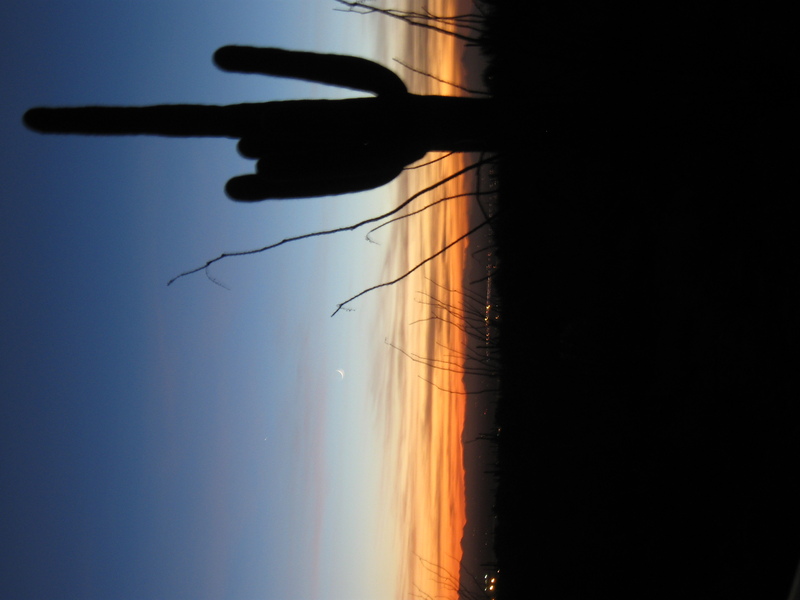 Since it gets dark out early this time of year, I needed something close by for my “consolation hike”. 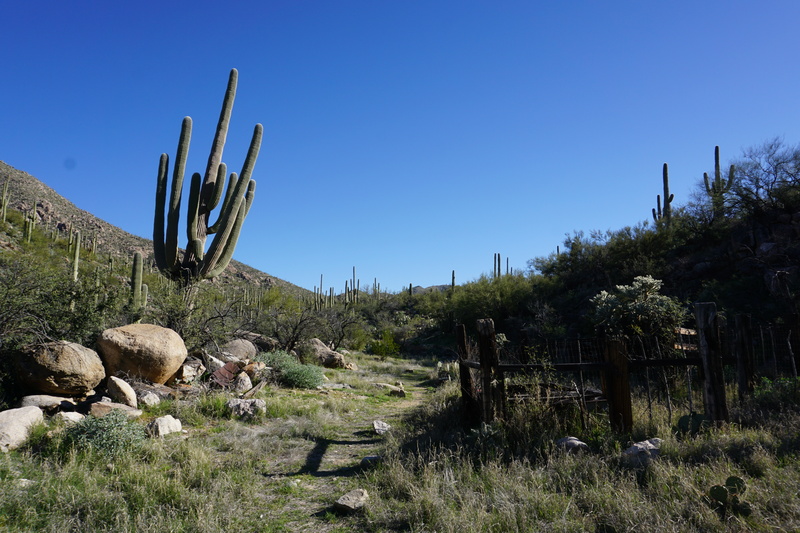 I have been meaning to return to the Tortolitas, mountains north of Tucson, and today looked like it was going to be the day. I had last hiked here about 4 years ago. The first part of the hike goes through a lot of construction and noise and that turned me off a bit to this area. I don’t think that the trail system through here was complete at that time. 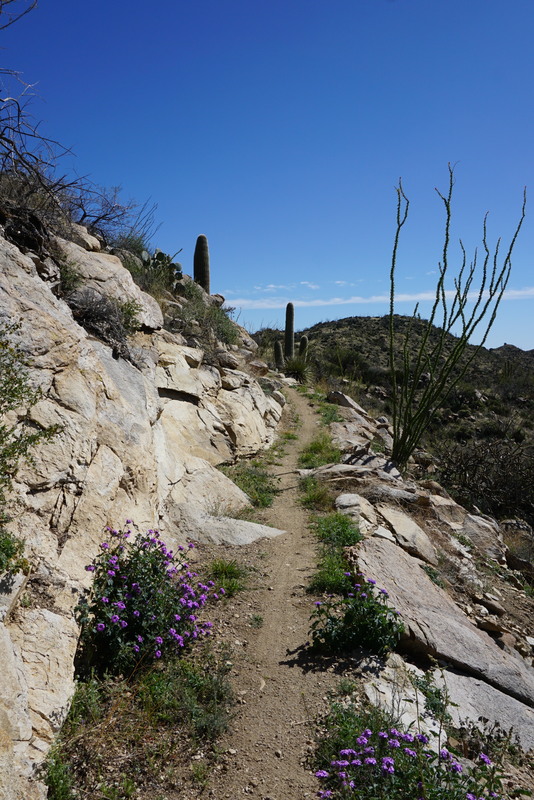 Now the trail system is complete and what I saw of it was in fantastic shape and well-maintained. 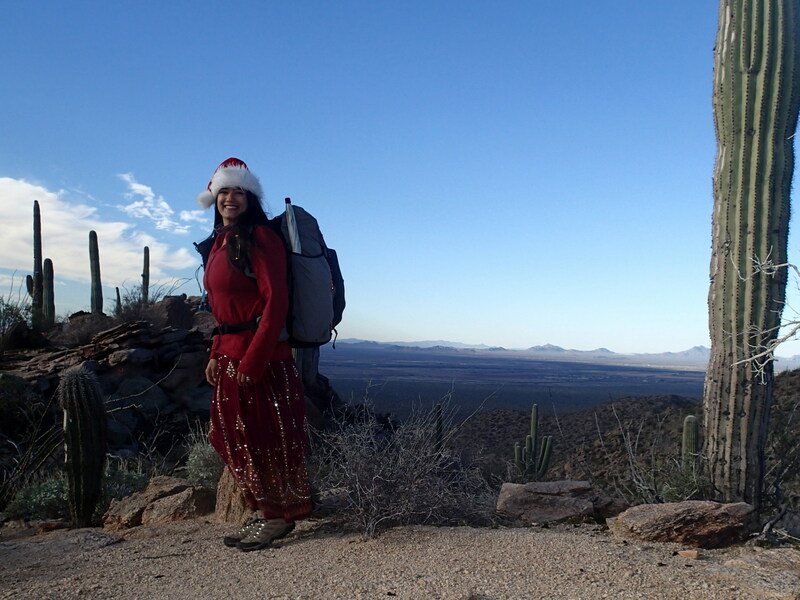 I chose to hike the Wild Burro, Upper Javelina, and Wild Mustang trails to an overlook- about 8 miles round-trip. 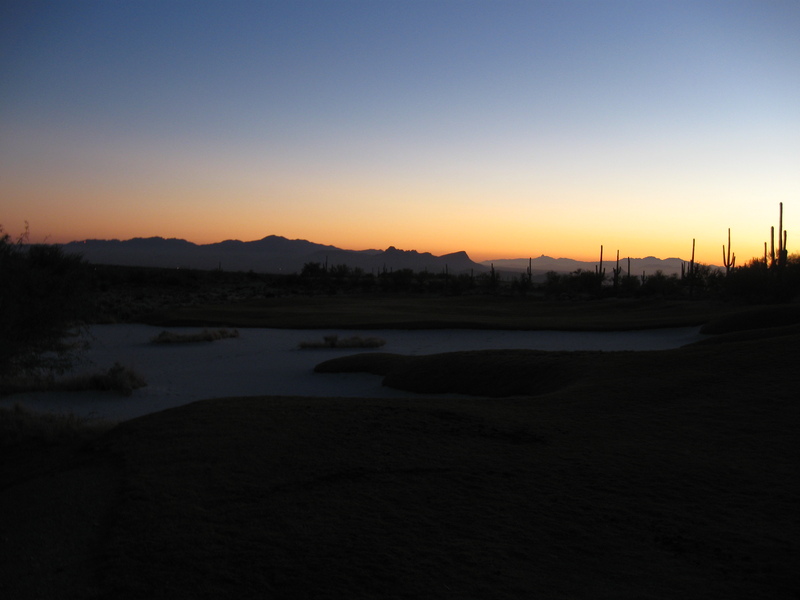 I got a pretty late start, but I had warm clothes with me and a headlamp if I needed to do some of it in the dark. 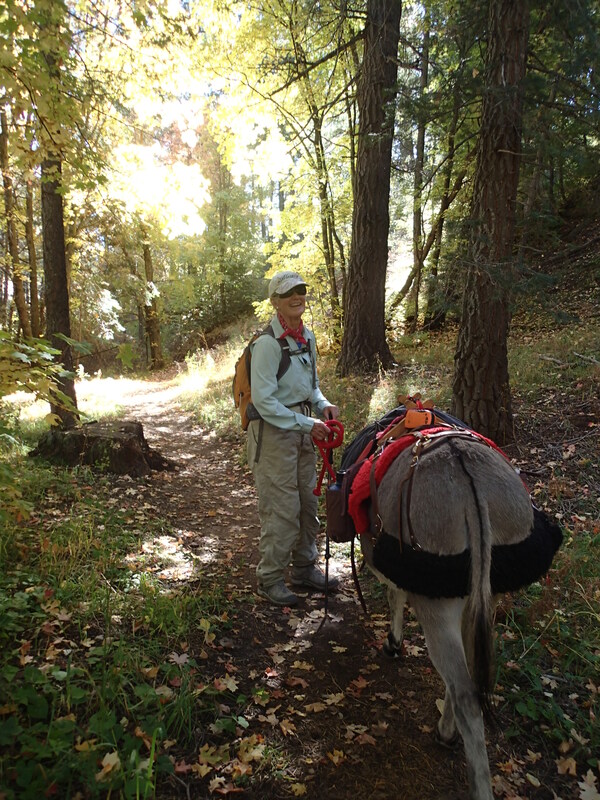 The first 1.3 miles on the Wild Burro is the way to get into the trail system. There is a path that is well-marked or you can just hike up the wash. The wash was not too sandy, and this part would be a pleasant walk if there was not a GIGANTIC hotel right on the wash. This is the new Ritz-Carlton hotel. I looked it up when I got home, and it was slated to open the day after I did this hike. So it wasn’t even officially open, and it was already noisy. At least they made it the same color as the mountain. There is also construction noise on top of that- there are several houses being built in the area as well. I suggest a pair of headphones for this part of the hike. I was glad I had mine. 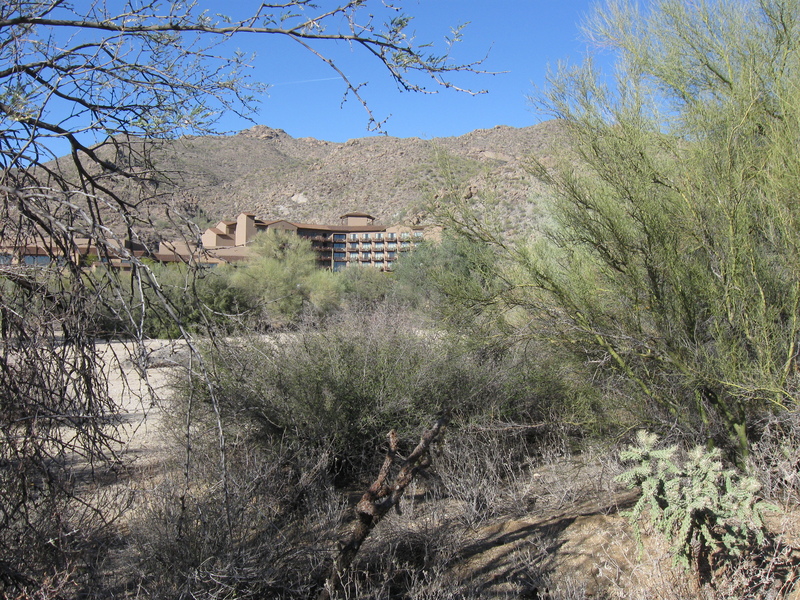 The trail junctions are well-marked and I took the Upper Javelina that climbed and contoured around the hill, above the pool of the hotel. This part was a little strange, I felt exposed and at the same time I thought it was weird that you could see right into the hotel. The trail finally contours into a drainage and you lose sight of the hotel. 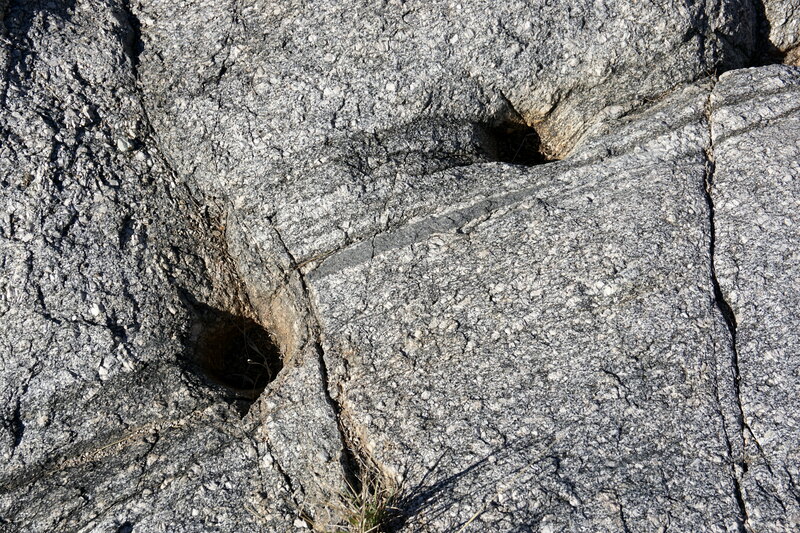 The trail construction is great in this area, winding around large boulders. I was really impressed with the condition of the trails, they were in such good shape I would consider coming back here to do a night hike. 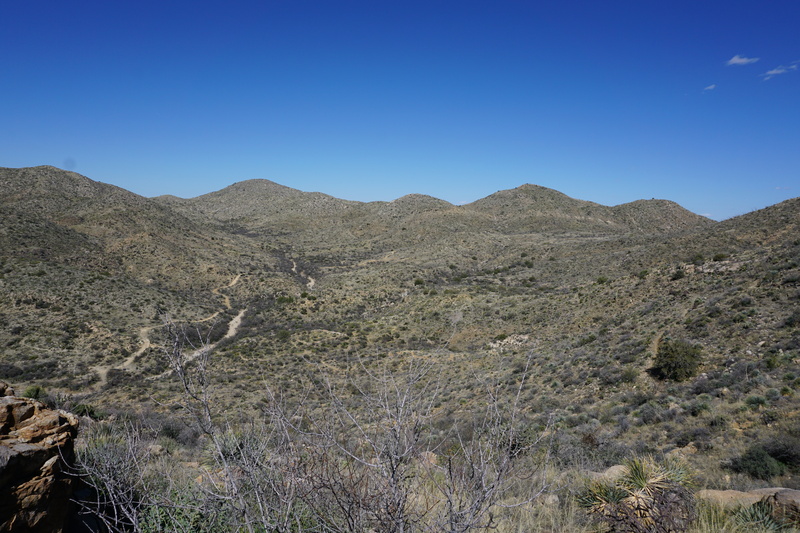 The Upper Javelina trail climbed to a junction with the Wild Mustang trail. 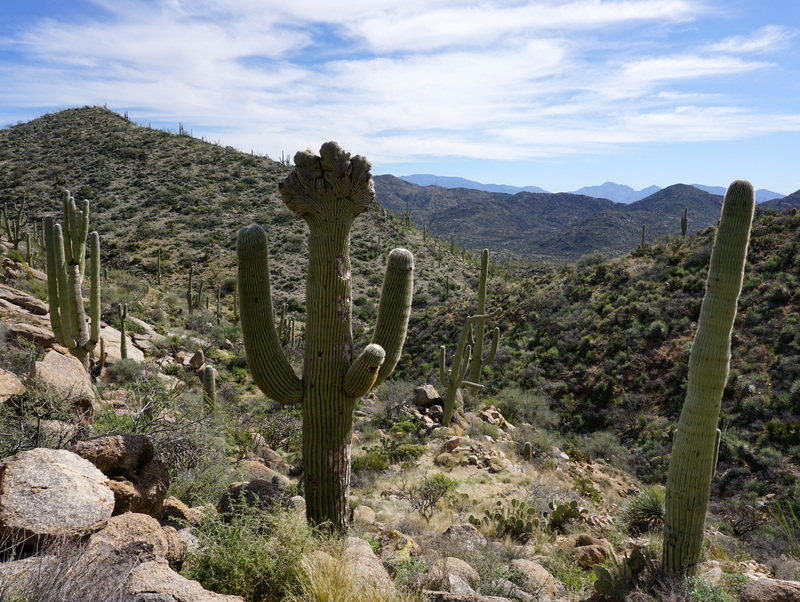 The Wild Mustang switchbacked up to the junction with the Cochie Canyon Trail and a great view of many of the mountains in the Tucson area. 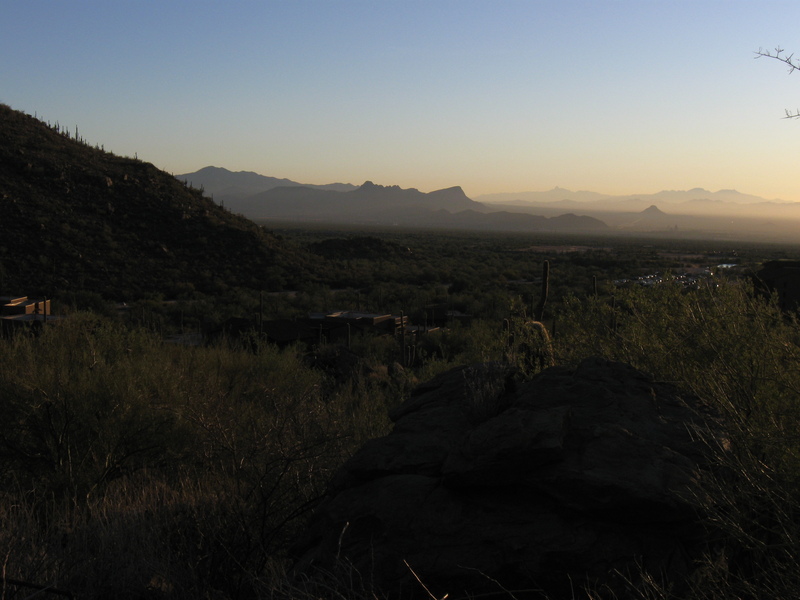 I could see Pusch Ridge, Mt. 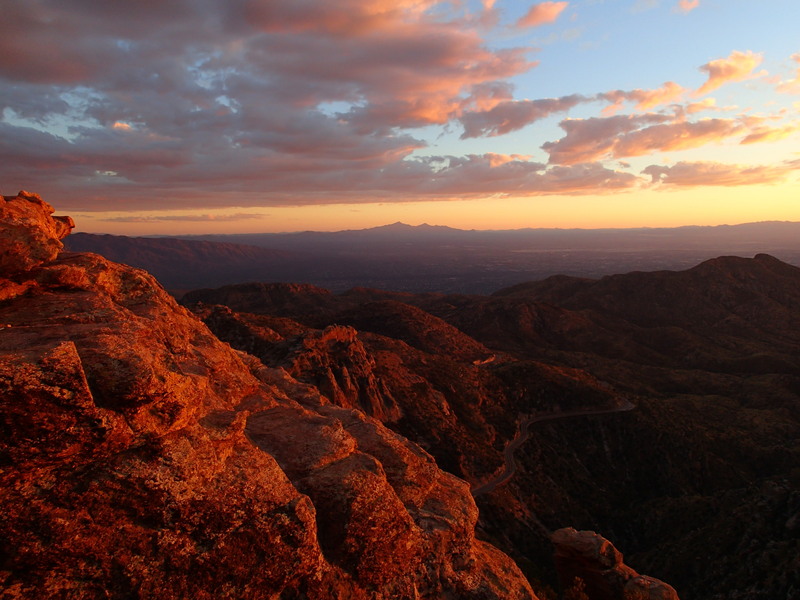 Wrightson, Baboquivari Peak, Kitt Peak, the Tucson and Silverbell Mountains, and Picacho Peak. Nice! It was getting close to my turnaround time, but I wanted to get to the overlook I had heard about, so I pushed myself to get there. 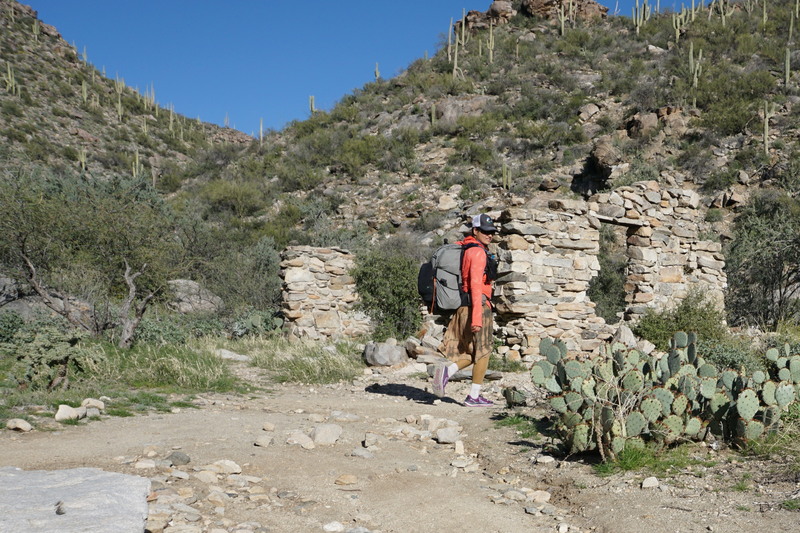 I was getting pretty tired, at this point I had gained about 1300 feet of elevation and had not slowed down or taken a break since I started. I made it to the overlook with five minutes to spare, and was relieved to have a seat, enjoy the view, and eat my peanut butter and jelly sandwich. 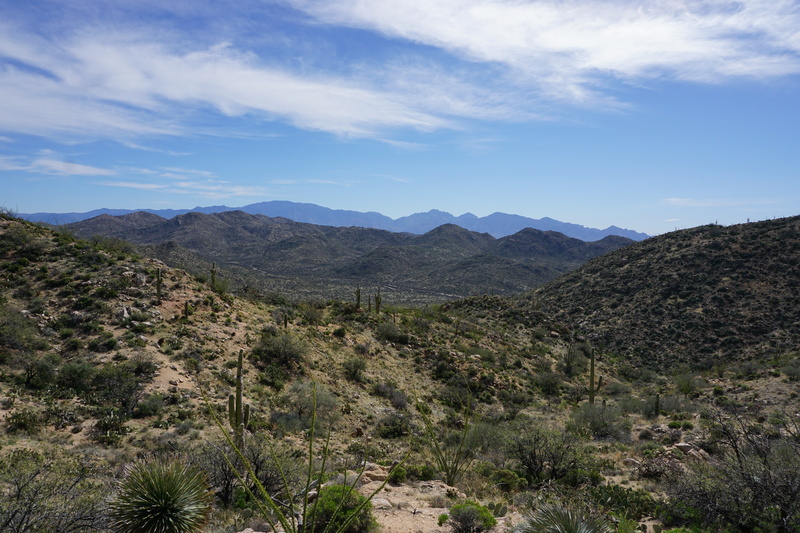 And what a view- I was high enough that the whole of snow-capped Mount Lemmon was visible, along with Samaniego Ridge stretching out to the north. 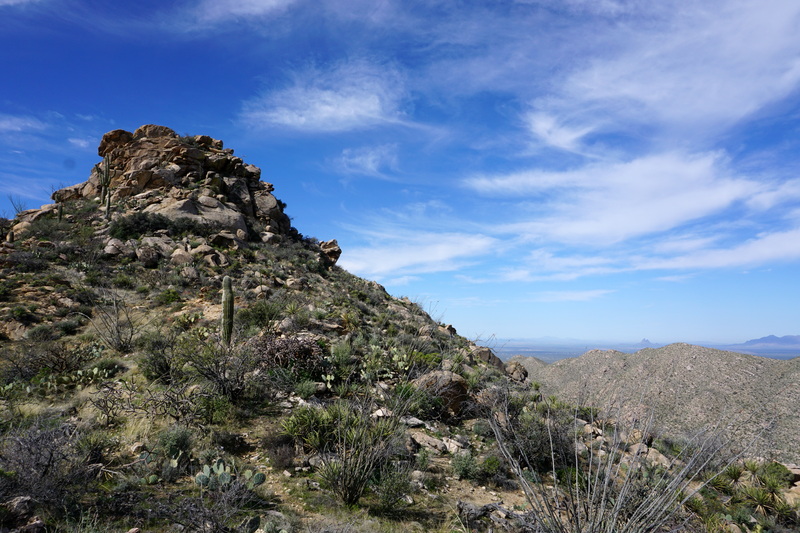 Cathedral Peak was visible, as well as the peaks of Pusch Ridge. Satisfied with my destination for the day, I headed back the way I came. 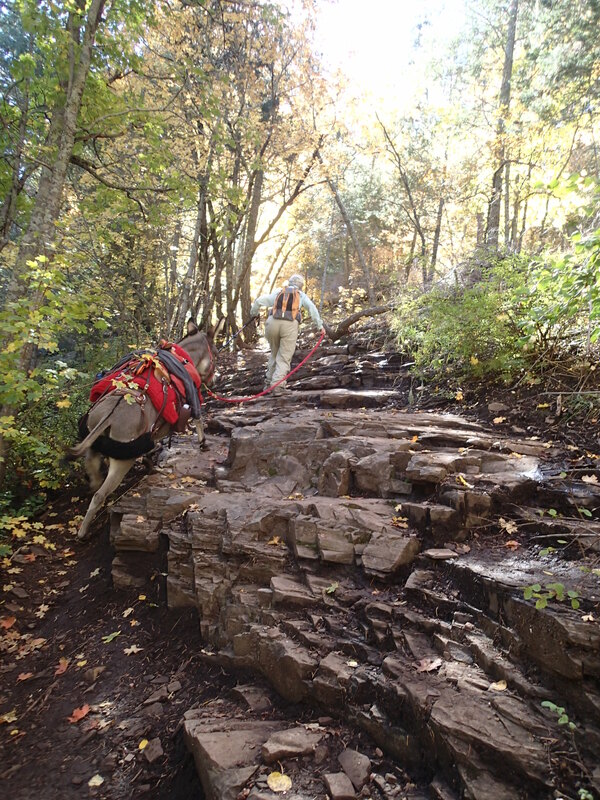 The Wild Mustang can be combined with several trails to do a 10-12 mile loop. I will be back to do this soon. The light as I was coming back was really pretty, and I had a feeling I was in for a good sunset. 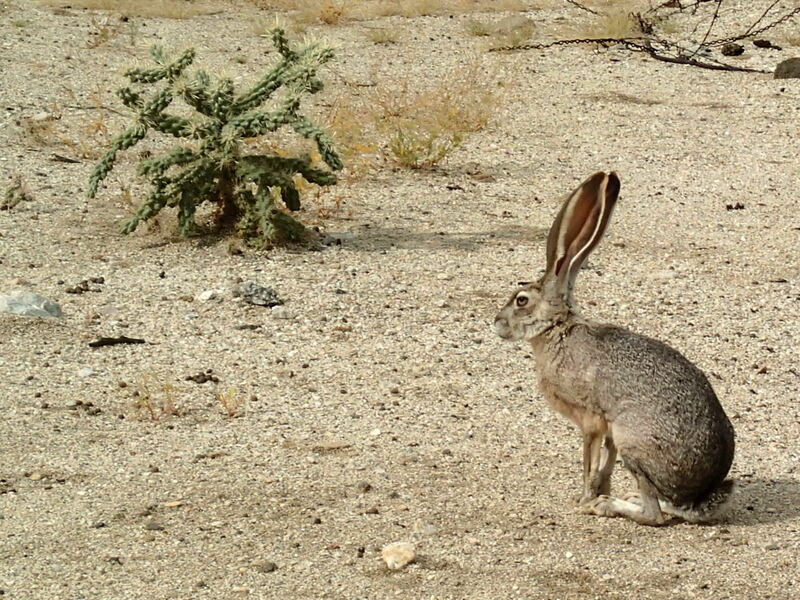 I reached the junction with the Wild Burro trail and sat for a while, watching the sun set and writing in my journal. I put on some music to drown out the noise from the hotel (kids screaming at the top of their lungs added into the mix from before). 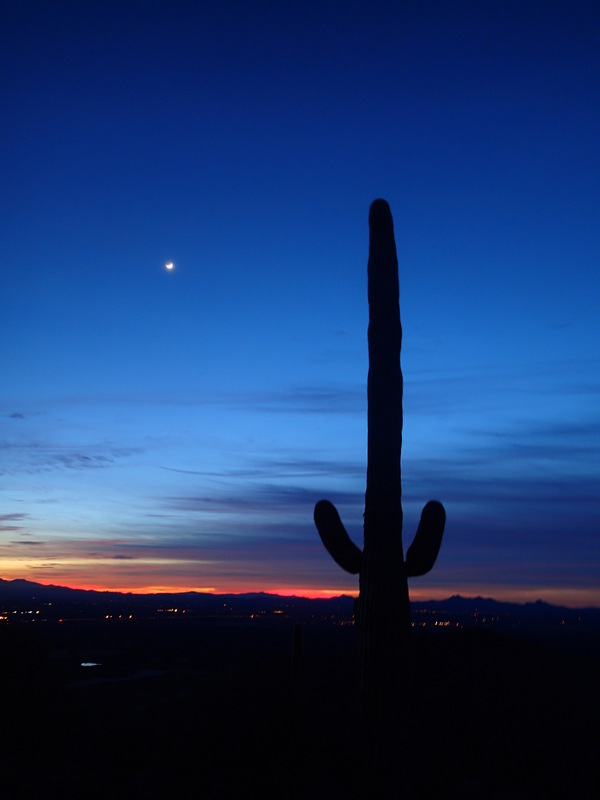 The sunset was beautiful and I hiked the last bit of the trail with my headlamp, reaching the car as the last glow of the sun illuminated a thin sliver of moon. 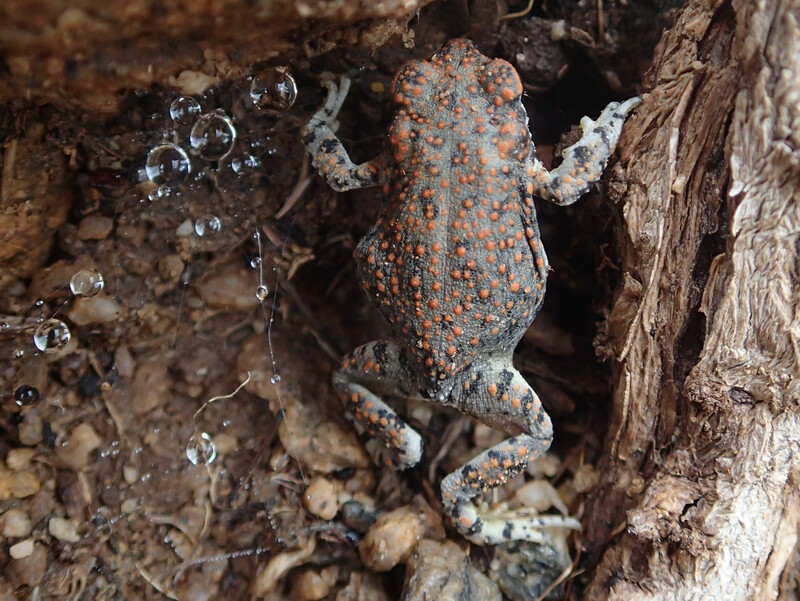 Not too bad for a consolation hike.